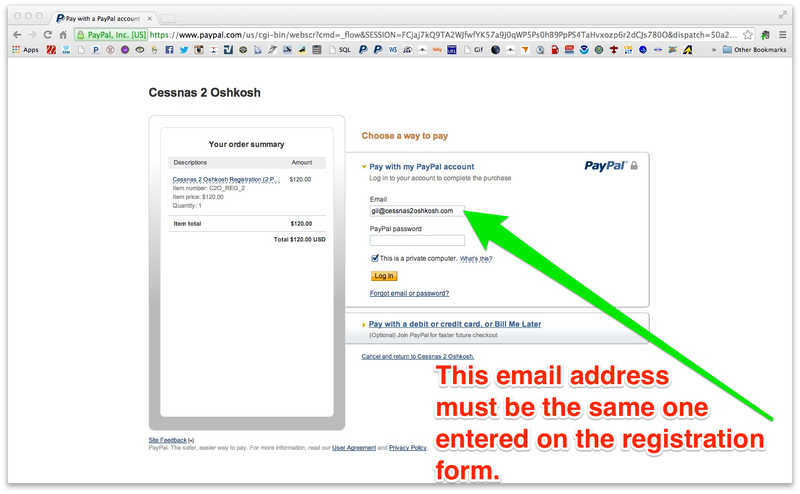 Cessnas 2 Oshkosh uses PayPal® to process the registration fee payment. The process is simple and intuitive and the transaction is protected by industry standard 256-bit encryption technology. You can pay using a PayPal® account, if you have one and want to use it for this purpose, or alternatively and still on Paypal's secure website, you can pay using any major credit card. The payment of the registration fee is required to complete the registration process. You may request a refund of the registration fee, if you decide to withdraw from participation in the group arrival. The deadline to withdraw from participation in the mass arrival and request a refund of the registration fee is the seventh Thursday before the arrival at midnight CDT (UTC-5). In 2019 that day is Thursday, June 6, 2019 11:59 PM CDT (UTC-5). This is also our deadline to place the shirts order with the vendor. To request a refund of the registration fee, send us an email message to payments@cessnas2oshkosh.com. Please, allow seven (7) to ten (10) business days to receive the registration fee refund minus any administrative fee charged by PayPal®. 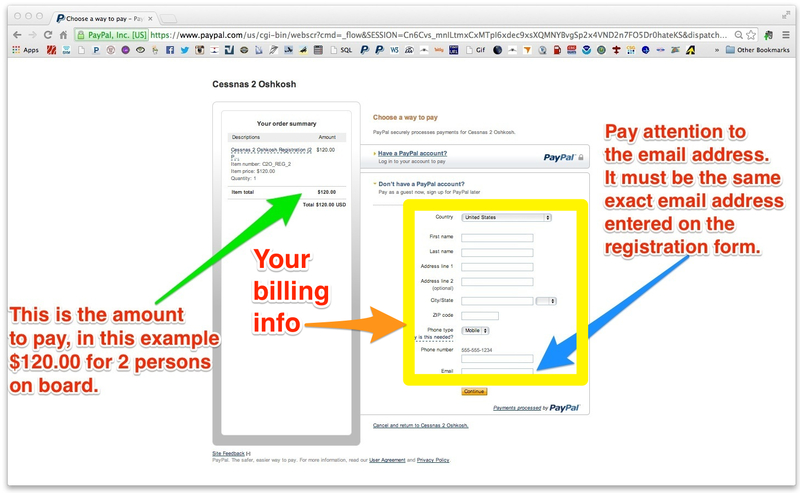 Following is a sequence of screenshots with detailed step by step descriptions of the payment process. Hover over a thumbnail to view an enlarged image. Click on a thumbnail to open a new tab or window to view a screenshot of the actual website page. Important items on each page are pointed out or highlighted. Screen 1. After completing and submitting the registration form, you will be presented with this screen, where you will verify the accuracy of the information submitted. Once you are satisfied you can click on the Pay Now button. 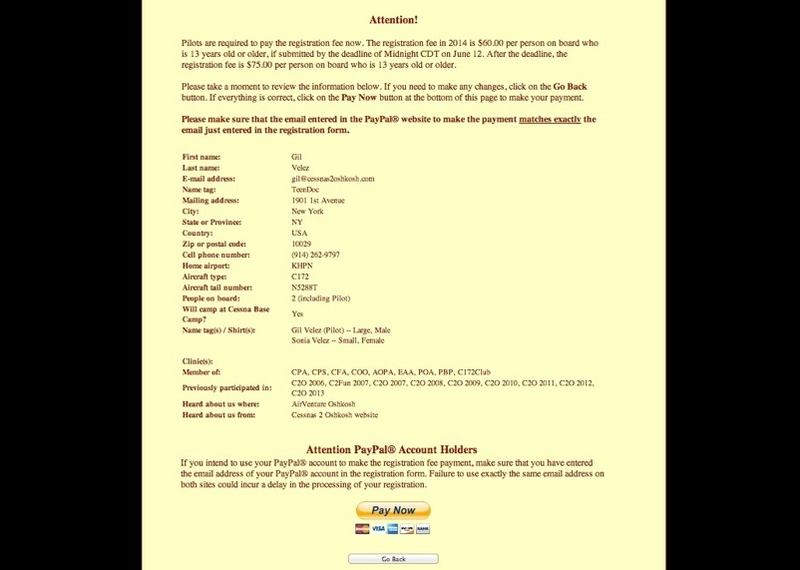 You will then land on one of the two landing pages on PayPal's website. 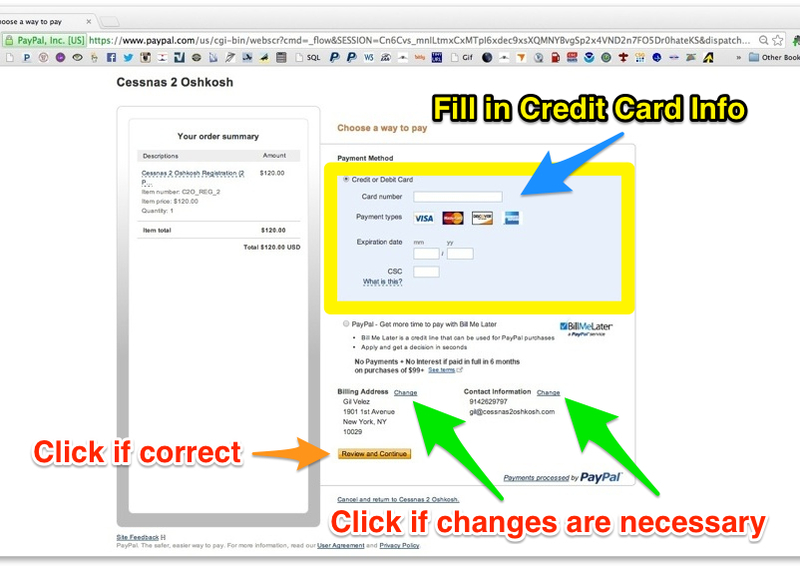 If you don't have a PayPal® account, or have one but have not recently access it, you will land on screen 2 below. On the other hand, if you have a PayPal® account and have recently access it, you will land on screen 5 below. Screen 2. This is PayPal's landing page. The amount to pay will show on the left column. 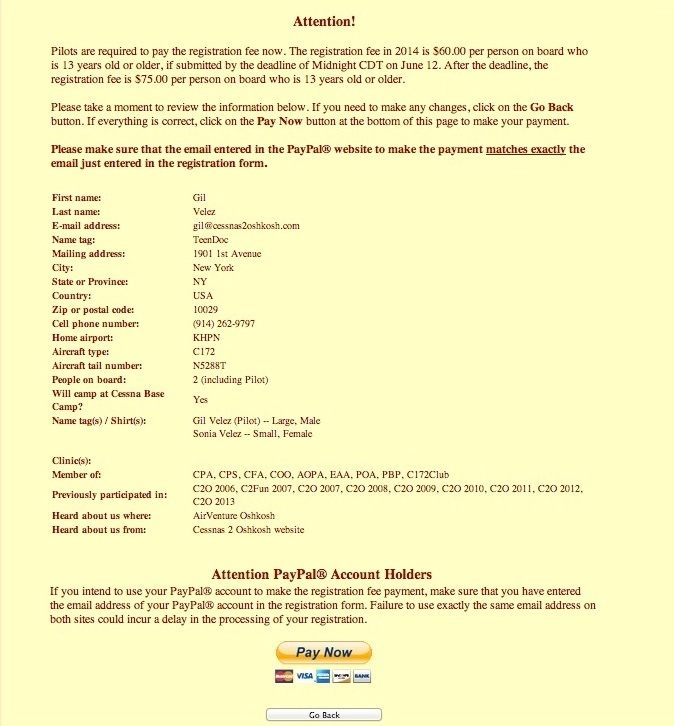 If you will be using a PayPal® account to make your payment, click on Have a PayPal account?. 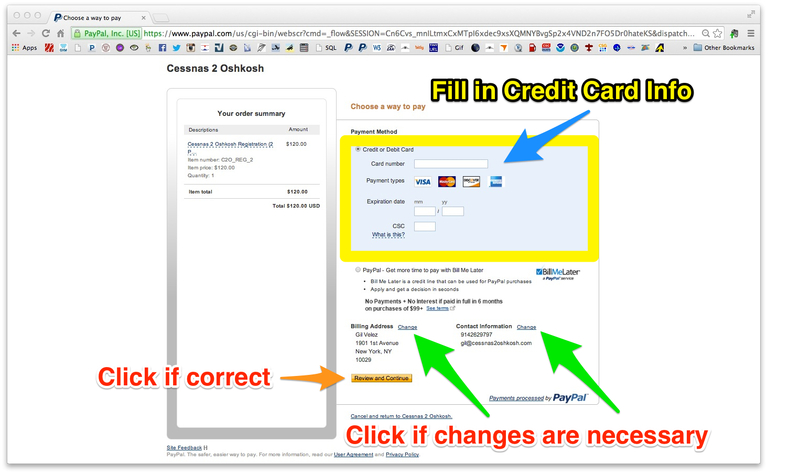 If you will be using a credit card, fill in your billing information and click on the Continue button. Pay particular attention filling in the email address box. 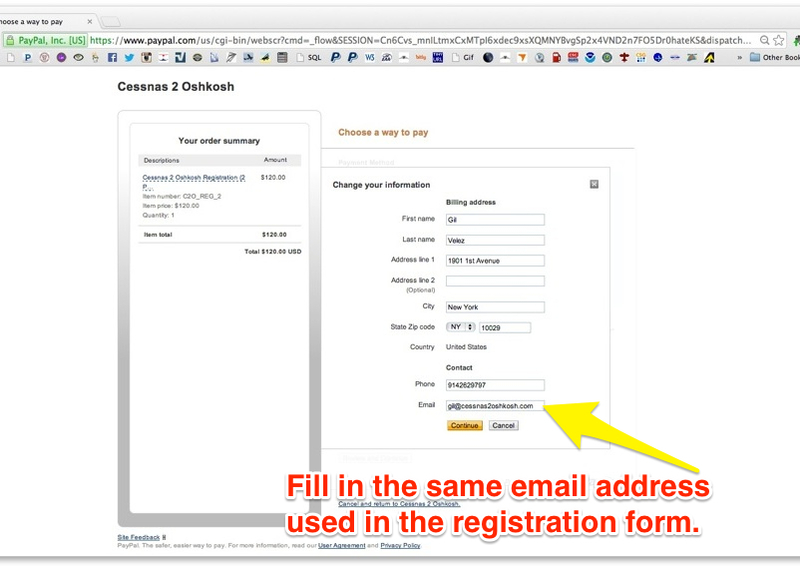 The email address entered here must match exactly the email address previously entered on the registration form. Screen 3. This is the next screen you'll see after clicking on the Continue button, if you chose not to use a PayPal® account to make your payment and filled in the requested information on the landing page. Select Credit or Debit Card at the top of the screen and fill in your credit or debit card information. Verify the accuracy of the billing information and click on the Verify and Continue button. If you need make any changes to the billing or the contact information, click on either of the Change links to do so. Screen 4. On this screen you will be able to make any necessary changes to the contact and billing information previously entered to match the information on the credit card account being used to make the registration fee payment. 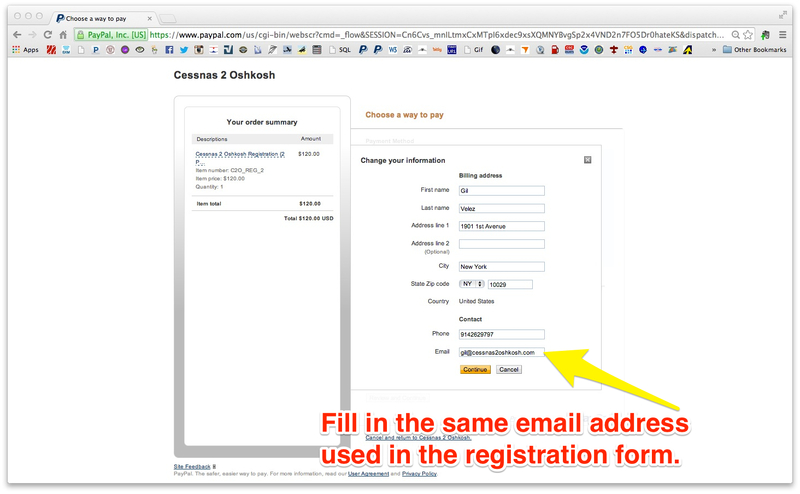 It is important to remember that the email address must remain the same email address entered on the registration form. (See Screen 1) Once all the changes are made, click on the Continue button. Screen 5. If you chose to use your PayPal® account to make your payment, you will move to the PayPal login page. Log in to your account and make your payment as you have done with other vendors. 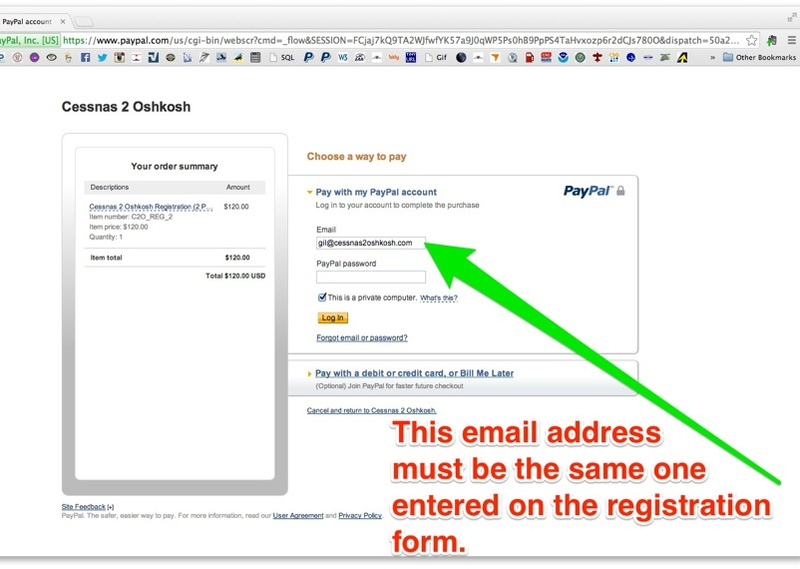 If the email in your PayPal account is different from the email address entered on the registration form, you must go back to the registration form and change the email address to your Paypal's email address and resubmit the registration form. Click here to read why we charge a registration fee. Click here to return to the registration form.